The set of salt and pepper shakers remain popular in Galactic Empire, but now you can deploy the two shakers on your dinner table. Like the idea? Let’s keep checking. This is a set of pretty cool and officially licensed salt and pepper shakers themed by Star Wars. 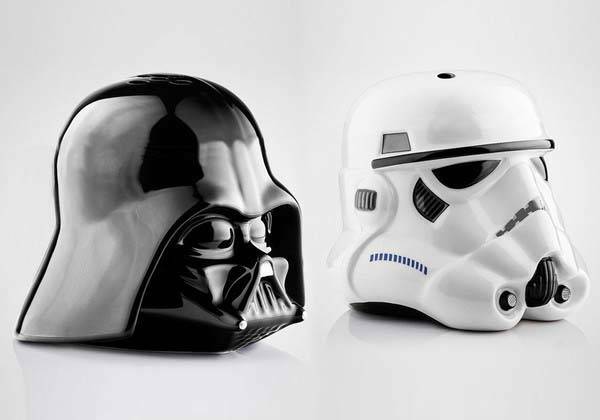 As we can see from the images, the shakers are based on two symbolic Star Wars characters: Darth Vader and Stormtrooper, delivering a mini Darth Vader’s helmet and a Stormtrooper’s helmet, and each one meticulously recreates the contour and detailing from its original look, but their mini sizes are designed to fit on your dinner table instead of your head in order to add some Galactic Empire’s taste in your food. The Star Wars salt and pepper shakers are made of ceramic, which delivers charming glazed exterior. Simply turning them upside down lets you dispense salt or pepper, you don’t even need to activate the dark side of the Force in your body. The Star Wars Empire salt and pepper shakers are priced at £12.99 (approx US$18.54). If you’re interested, jump to The Fowndry for its more details. BTW, also don’t miss the Minions salt and pepper shakers and more related cool stuff by following tags.